Lakeside Cabin within the wonderful Pine Clad Forests of Southern Norway Easy Drive from Ryan Airs Oslo Torp Sandefjord. This cabin is idealy situated within a resonably short drive from Oslo Torp... The Ryanair Airport. You will find a wonderful woodland retreat... well furnished.. With open fire... One of the main features of this property is the wonderful lakeside position just 50 metresfrom the cabin.... Furu Cabin.. is the place to relax... The cabin is with 60 metres of two other cabins. But they are not intrusive... they are idea if larger parties want to travel together. The area has walks... and great fishing possibilities. Trout and perch being the main fish caught. Staying at this Cabin will be a chance to re charge your batteries,,, Reflect on the things that really matter in life.. and spend quality time with family and friends. Sleeps 6. With stunning lakeside views & just over an hours drive from Oslo Torp Airport at Sandefjord (Ryanair) is the Lovlia apartment near Risor Norway. Every season has its advantages at Lovlia.... Each season is more defined than the UK... We have recorded temperatures from plus 30 degreed in the Summer t minus 30 in the Winter... !! Come to Lovlia to Slow down get away from it all and have some old fashioned family time. Summer ... During the Summer the water is warm enough to swim in the lake... or perhaps take a trip to to the small local beach .. just 5 mins by car from the house... Fish Mackrell in the Fjord and have a BBQ on one of the 100s of small islands. Dont believe the myth that Norway is cold 365 days a year! We often get far better Summers than the UK! Sleeps 6. Wonderful forest cabin situated cabin in Southern Norway... Ideal summer or winter... Few minutes from a fantastic sandy freshwater beach. This cabin is ideally situated within a reasonably short drive from Oslo Torp... The Ryanair Airport. You will find a wonderful woodland retreat... well furnished.. With open fire... One of the main features of this property is the wonderful and secluded sandy beach with 700 metres of the cabin.... The river is closer just 20 meters from the cabin... This beach has a volley ball net... and is ideal for swimming. 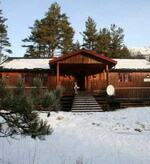 Pine Wood Cabin.. is the place to relax... The cabin is with 60 metres on one other cabin... but this is only used occasionally by the owners.. so the chances are you will be alone.. sleeps 9. 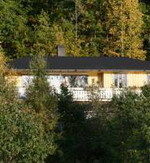 Four bedroom holiday home in beautiful, serene surroundings in the fjords of Western Norway. The climate in the western part of Norway is relatively mild. Summers are often nice and warm, contrary to what many people think of Norway. In wintertime snow only stays for a few days at a time. However, ski resorts with permanent snow are within a 45 minutes drive away. Historically, Hardanger is a fruit cultivation area, making it a fantastic place to go during the blossoming season in May. Nearby Tyssedal and Odda have a lot of interesting industrial history with spectacular museums to tell the story. 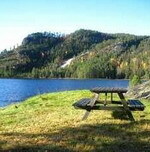 The area offers a lot of possibilities for hiking in the most scenic surroundings. Families might like to visit Hardanger Feriepark in Kinsarvik (45 min. by car), which is a small amusement park with pools and water slides. Sleeps 12.